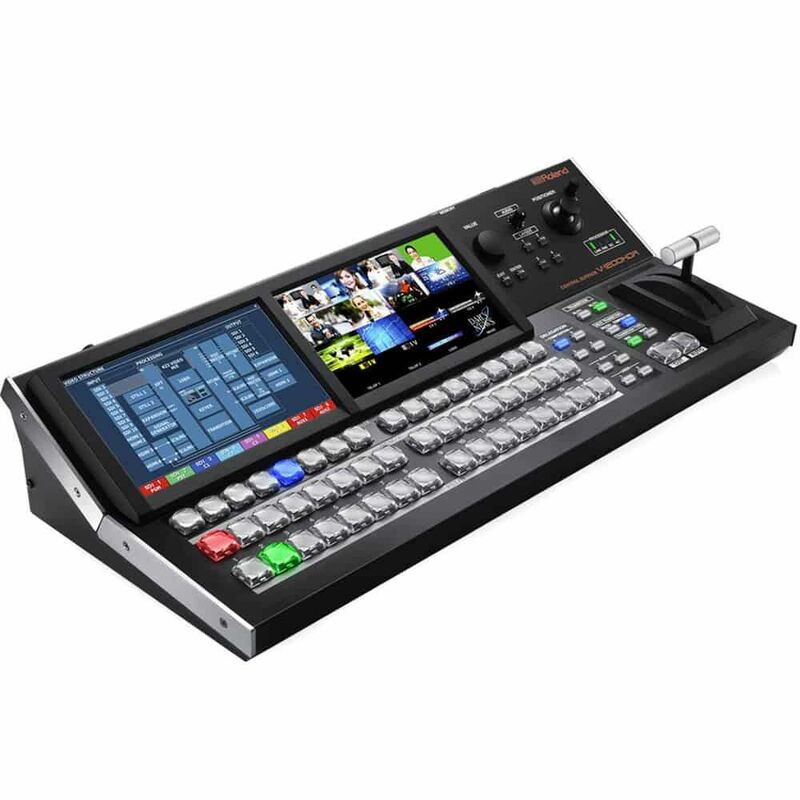 This Roland V-1200HD-SYS Bundle combines the V-1200HD Multi-Format Video Switcher with its corresponding V-1200HDR Control Surface. These two components provide a versatile HDMI/SDI switching solution for studio or location use. 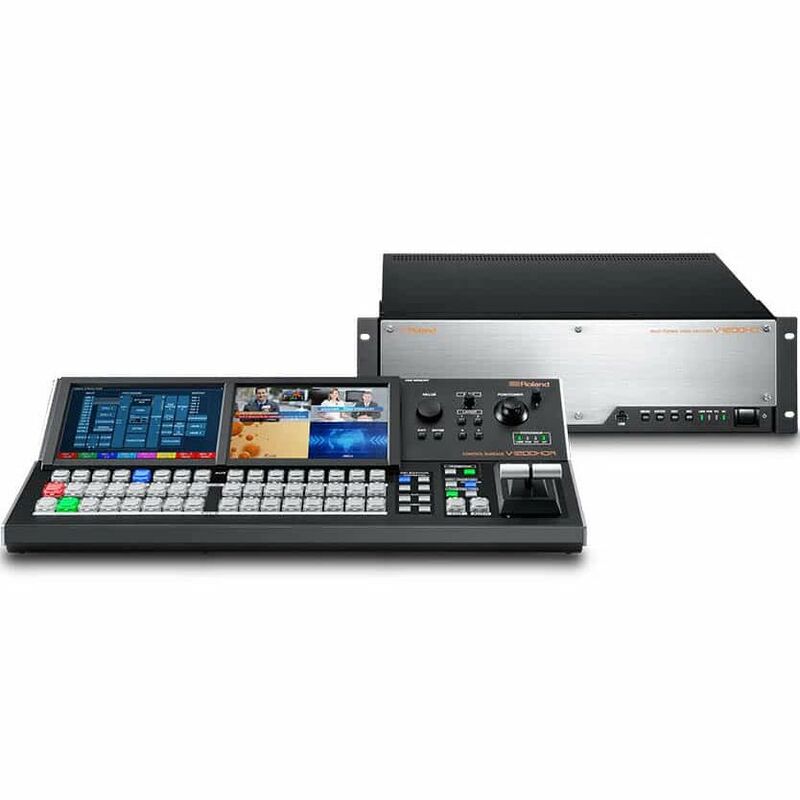 With dual mix effects buses, Roland's V-1200HD Multi-Format Video Switcher is versatile, space efficient, and can handle 10 HD video streams in 4:2:2 or 4:4:4 color space. 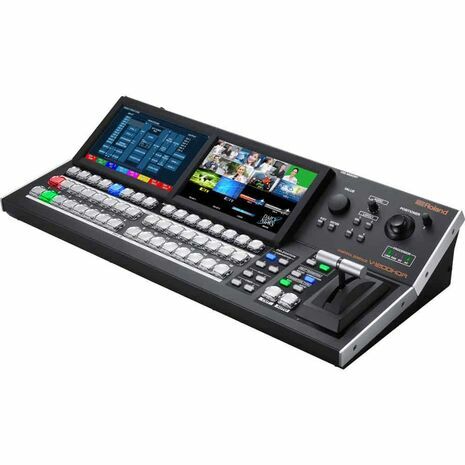 Whether implemented in a video studio or a live event venue, the V-1200HD can handle video and computer sources, and route them accordingly. Embedded as well as external audio can be routed through the switcher, and the V-1200HD will accept up to 92 inputs and outputs. I/O can be expanded through dual expansion slots. Aside from routing video and audio signals, the V-1200HD can remote control up to 7 cameras, and can itself be remote controlled through V-1200HD Remote Control Software. A wide variety of video effects enhances broadcast studio productions. Composition with freely selectable priority can be accomplished using the four scaler-equipped keyers. The system also features high-end Chroma Key, as well as the External Key essential for title compositing. In addition to PGM and PVW output, two AUX buses are usable for output when in the 1 M/E mode. Multiple M/E choices allow for a diverse range of video production applications in one switcher. 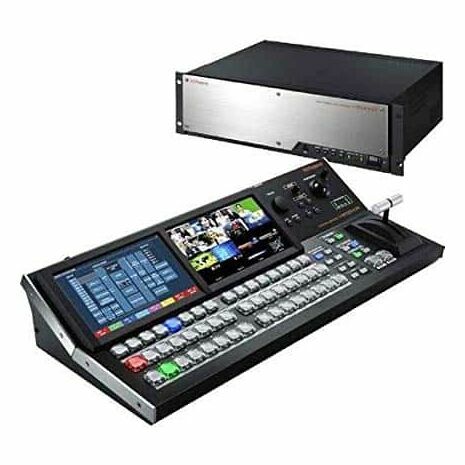 The V-1200HD is ideal as a main switcher for concert recording and for a live feed. Through a variety of multi-view functions, even a large number of sources can be checked at a glance. The M/E configuration can be varied as desired to meet the needs of the production. Control up to four remote cameras, ensures creative productions even with limited camera operators. Equipped with HDMI input and output with multi-format support. Freely mix computer and video sources and output to a wide range of displays and devices. 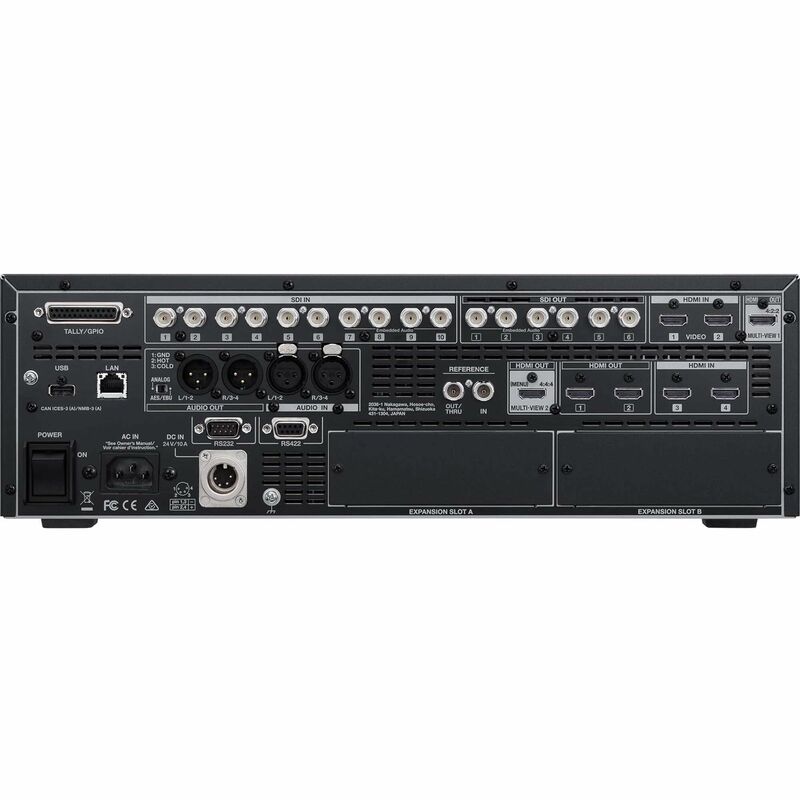 Along with ten SD/HD-SDI inputs, the V-1200HD features four HDMI inputs. 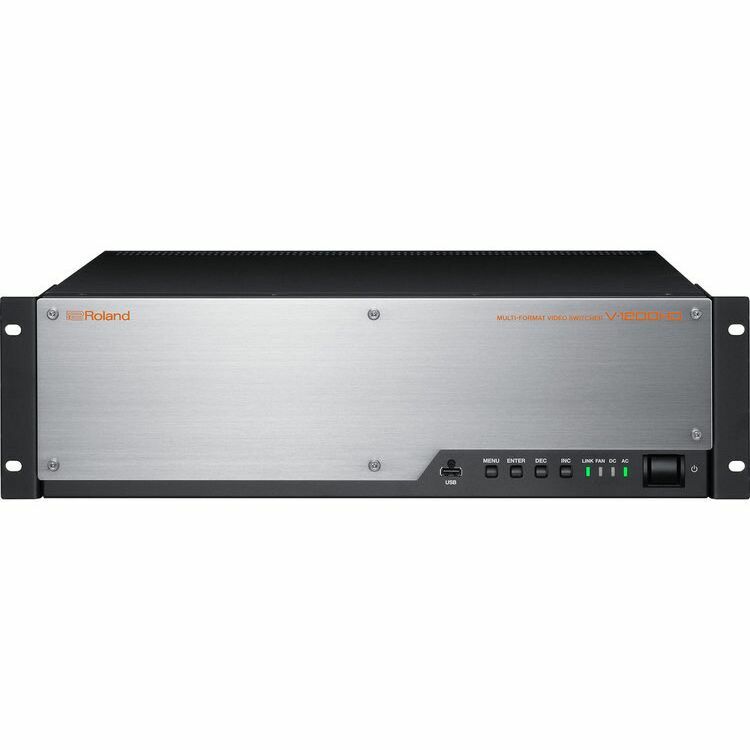 Six SD/HD-SDI and two HDMI outputs are also provided. 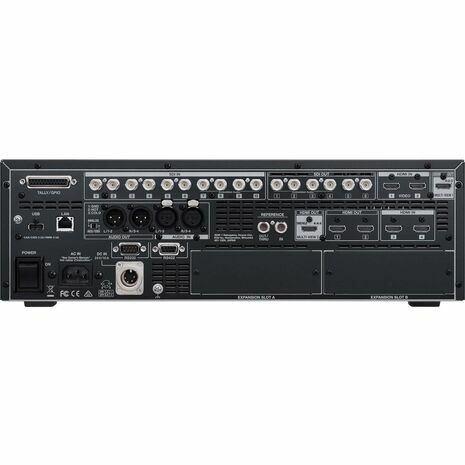 Among these, the two HDMI inputs and outputs offer multi-format support. Computer sources with varying resolutions and frame rates are supported without a need for video converters. The signal is passed directly to the 4:4:4 process, so it can be output, unchanged, at the same high resolution. What's more, using a separately available XI expansion card with a built-in scaler makes it possible to mix digital and analog inputs and outputs. The V-1200HD supports a large range of control as a video/audio hub. 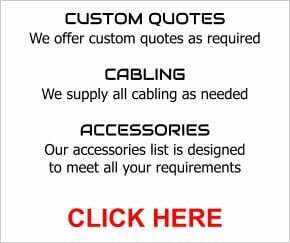 The full-featured routing functionality enables conversion and distribution of a high number of video sources in a variety of formats. The V-1200HD can also be controlled with remote operation as a video/audio source hub from a variety of control terminals and programs. 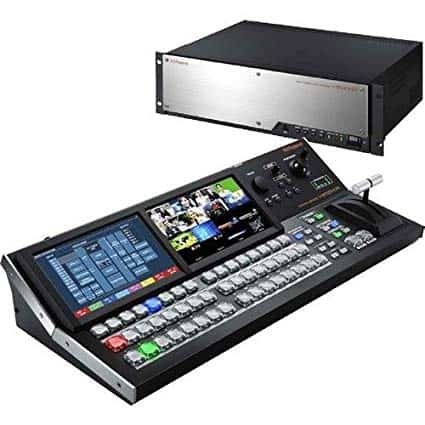 In addition to just simple video switching, the system also offers functions available only on production switchers, such as distributing PinP video to various locations. This provides a standard 2 M/E operation style. Two keyers can be used with each M/E. Keyer priority can also be assigned and changed. Not only is re-entry of the video source from M/E 1 to M/E 2 possible, but so is reverse re-entry from M/E 2 to M/E 1. Each of the two M/Es can be output independently allowing for applications such as simultaneous transmission of captions in two different languages. This is the highest-performance operation style, capable of using PGM/PST rows as the final stage in addition to 1 M/E. All four keyers can be used in 1 M/E. You can freely change the priority of each keyer, and even copy keyers. This mode enables complex mixing operations such as a video source plus 4-layers of composition and transition functions to another single video source. There are two scalers between the 4:2:2 engine and the 4:4:4 engine, and two scalers between HDMI IN 3 and 4 and the 4:4:4 engine. These enable switching, self key composition, and matrix output. When using HDMI direct in and out, all processing is done in a 4:4:4 10-bit color space that supports RGB and computer signals. Control all the advanced functionality of your V-1200HD switcher with the Roland V-1200HDR Control Surface. 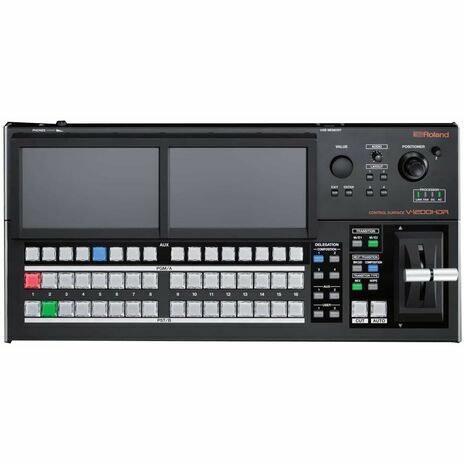 Enclosed in a sleek, modern chassis, the V-1200HDR provides a professional physical control surface for the V-1200HD with dual LCD touchscreens for monitoring and control, a large T-bar for effects and transitions, customization and operation of the mix effects buses, HDMI video outs, and a plethora of buttons for source switching.